Troost MAX travels from downtown to the Crossroads district, Hospital Hill and south along Troost to Bannister. Troost MAX offers local service south of 75th Street. Other major destinations include the East Village development (currently under construction), Discovery Center, UMKC Hospital Hill and Main Campus, Rockhurst University, The Landing, Truman Medical Center, and Children’s Mercy Hospital. Park and Rides are located at 31st & Troost, 95th & Troost, and the Bannister & Hillcrest area. 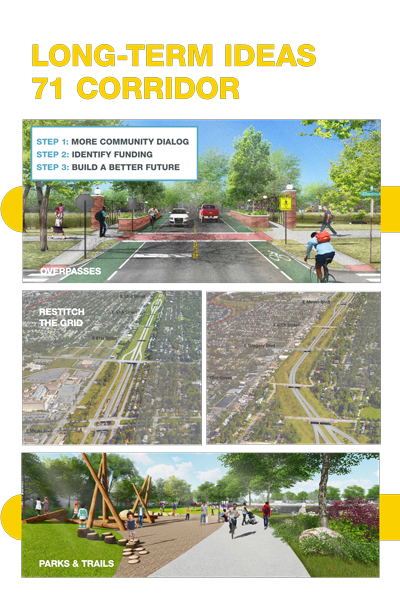 Trail Connections are a vital part of Troost MAX: a future trail between Troost & Bannister will connect to the Trolley Track Trail near 87th & Garfield. 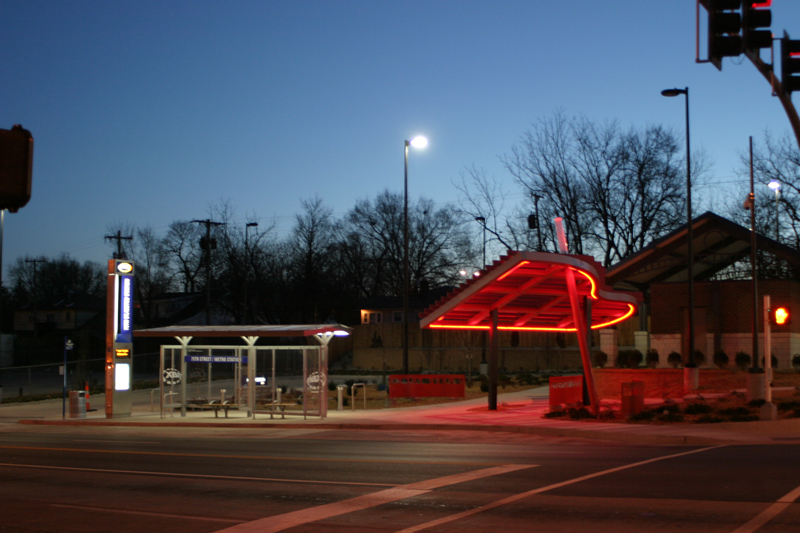 MAX stations are well-lit and feature a distinctive, easily identifiable information marker, and a specially designed passenger shelter. 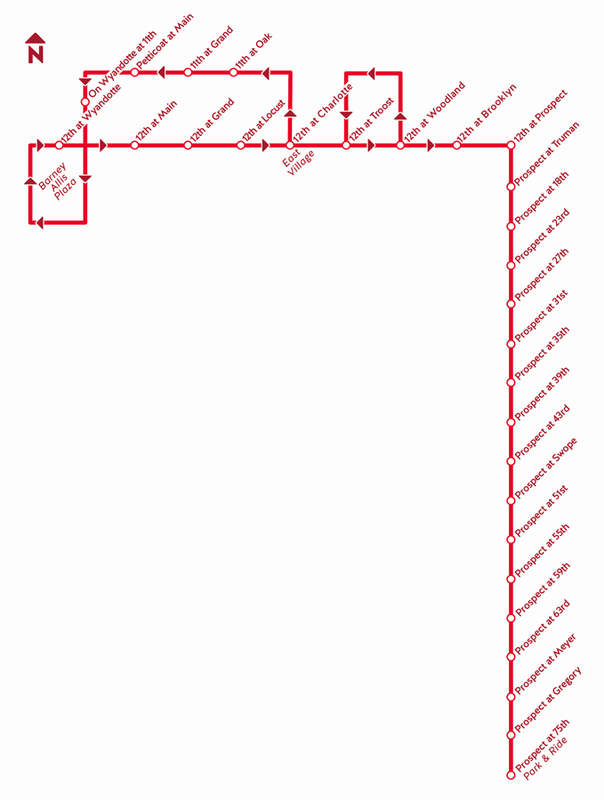 The stations are clearly marked and named, featuring easy-to-understand route maps and real-time transit information. Riders have instant and constantly updated access to the exact arrival time through GPS technology and real-time signs at MAX stations. 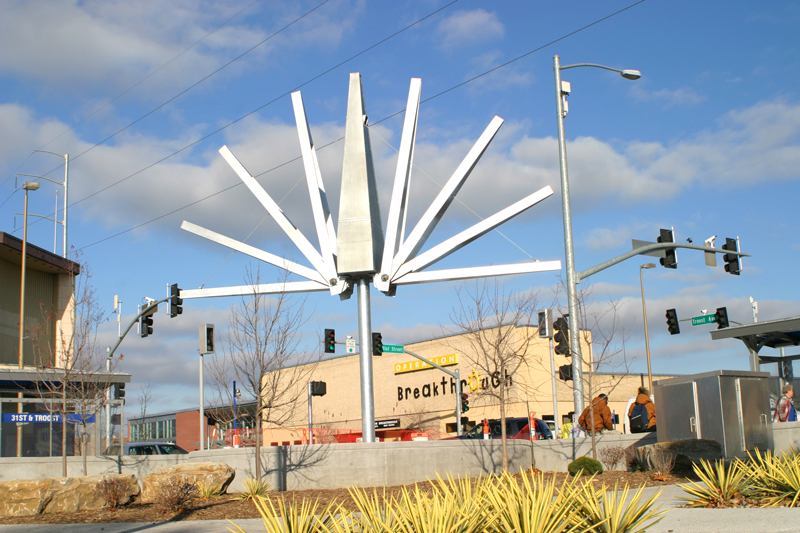 For the first time, the Kansas City Area Transportation Authority has commissioned original public art at prominent locations along Troost MAX. Artists drew upon community input and local history to create interesting and compelling works. This large-scale incorporates linguistic history in the structure’s design. 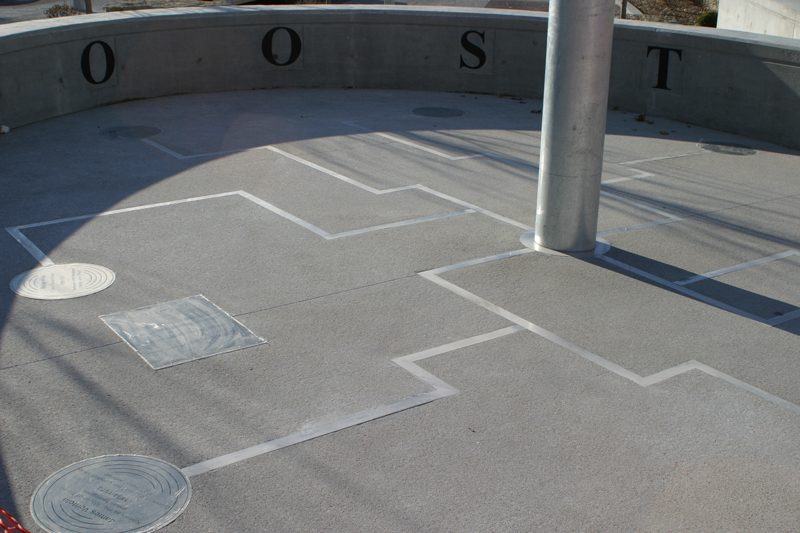 Dehaemers designed the structure to resemble a tree, playing off one origin of the word “Troost,” which can mean tree. The motion of the structure results in a creation that is constantly in flux, much like the history of Troost. Dehaemers recently completed Seven Sentinels at the city’s vehicle impound facility. Nationally, he has been recognized by the Public Art Network’s Year in Review for four years in a row starting in 2004, and again in 2009. 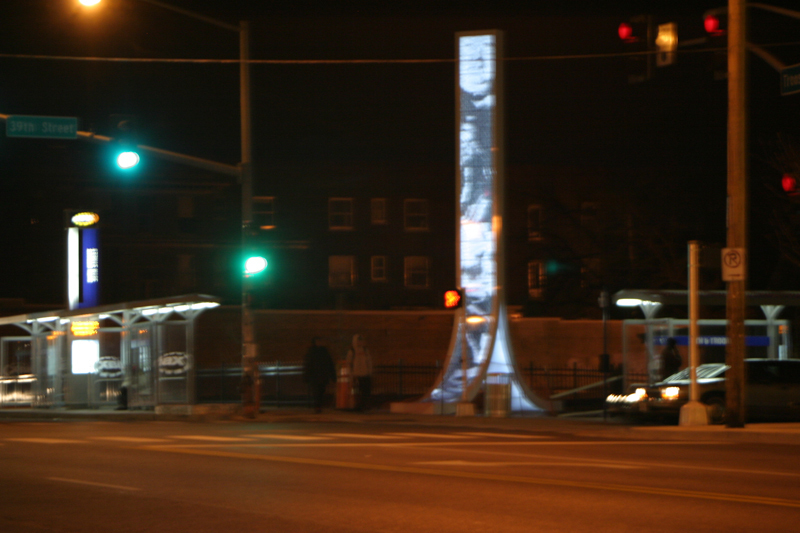 See a video of the sculpture in motion. The Catholic Key covered the March 2011 dedication of Unite. Jefrë created a sculpture that draws on the image of hands coming together, evoking a joining together or way to cross a divide. 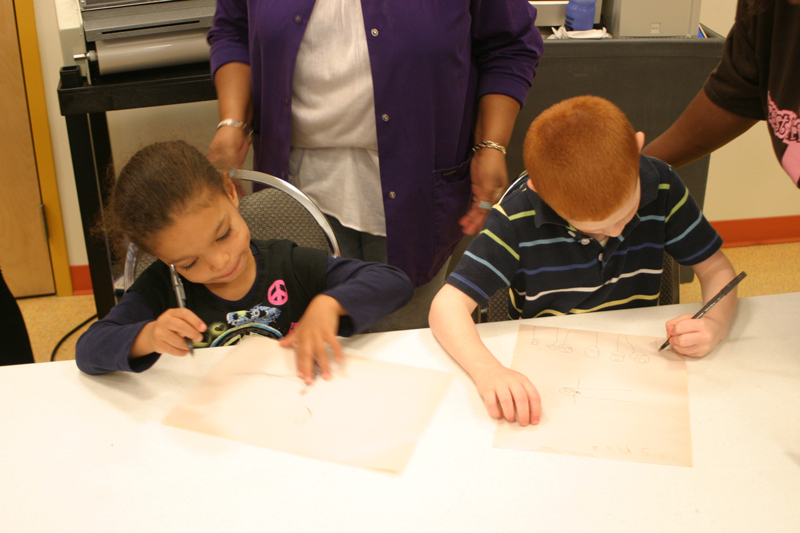 The artist worked with area children, gathering drawings of what the children want to be when they grow up. These drawings of doctors, firefighters, engineers and other vocations are incorporated into the sculpture. Jefrë is an internationally acclaimed emerging public artist based in Miami who has received numerous awards for his innovative designs. After ten years working with international design firms, Jefrë launched his own couture public art studio in 2008 with a focus on environmental art, green roofs, boutique plazas, parks, and public art master plans. 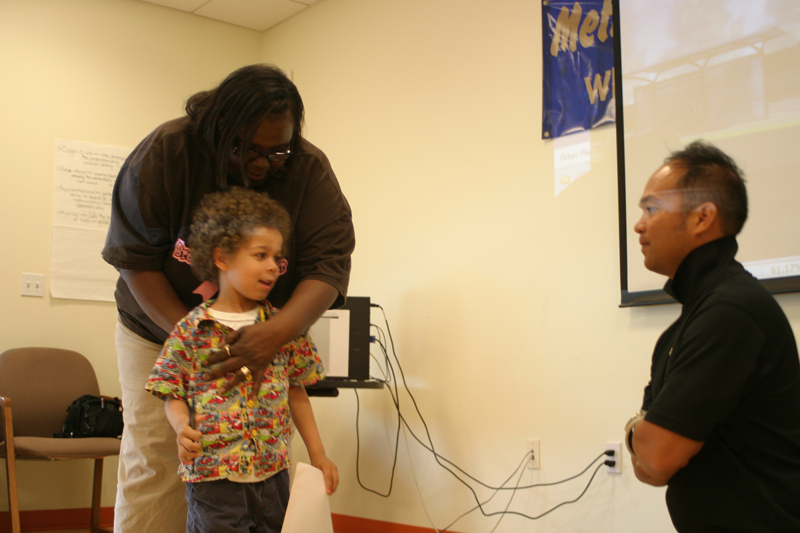 In his first year, he has been selected for six national blind public art competitions in New Orleans, Washington D.C., Toledo, Palm Beach, Orlando, and Philadelphia. 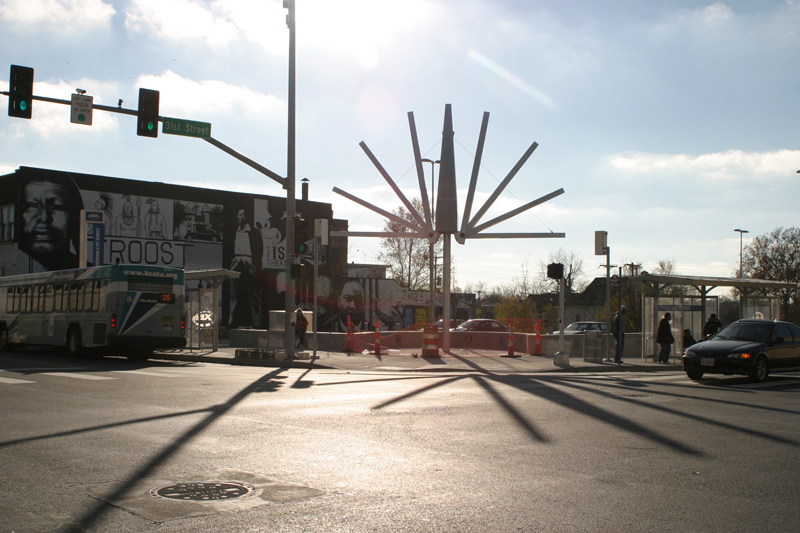 The installation chosen for the 75th & Troost MetroStation is a tribute to Kansas City’s rich jazz history. The sculpture is an oversized piano structure with LED lighting. It is a powerful red epoxy painted steel and aluminum structure. 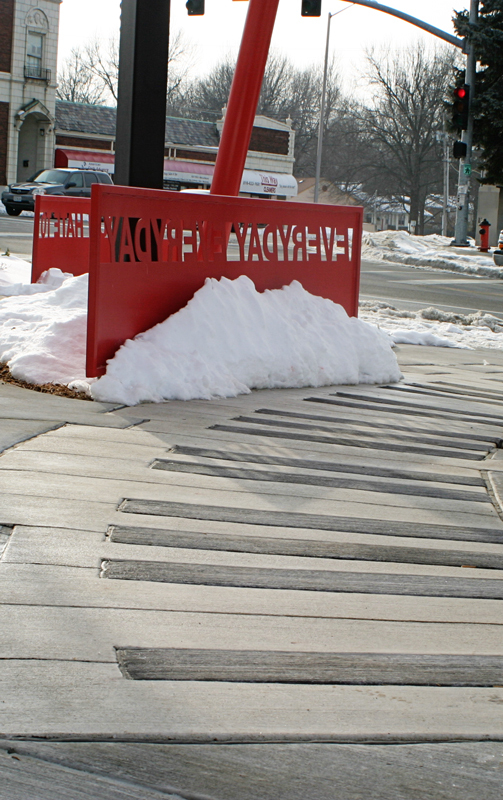 The open, cantilevered framework suggests the raised lid of a grand piano; pedestrians can actually walk under the structure on a walkway or sit on benches resembling the piano’s keyboard. David B. Dahlquist is a nationally-recognized public artist and teacher. He is the Creative Director of RDG Dahlquist Art Studio, a comprehensive design and fabrication facility within RDG Planning & Design, specializing in the integration of artwork within building architecture and the landscape. The Harry Wiggins Trolley Track Trail is a popular facility for walkers, runners and cyclists. The trail is named after the late Senator Wiggins who throughout his 28 years of representing the 10th district, sponsored KCATA’s tax legislation. The trail was the site of Kansas City’s last streetcar line, the Country Club route. It’s six miles long, from Volker to 85th & Prospect. The streetcar right of way is seven miles, from Westport Road to 85th Street. An original, renovated Country Club Streetcar Station is located at 54th and Brookside. The trail surface is compacted, crushed limestone. However, the surface south of 85th Street is asphalt, as are some other short sections in areas subject to brief flooding in heavy rain. KCATA owns and maintains the trail. 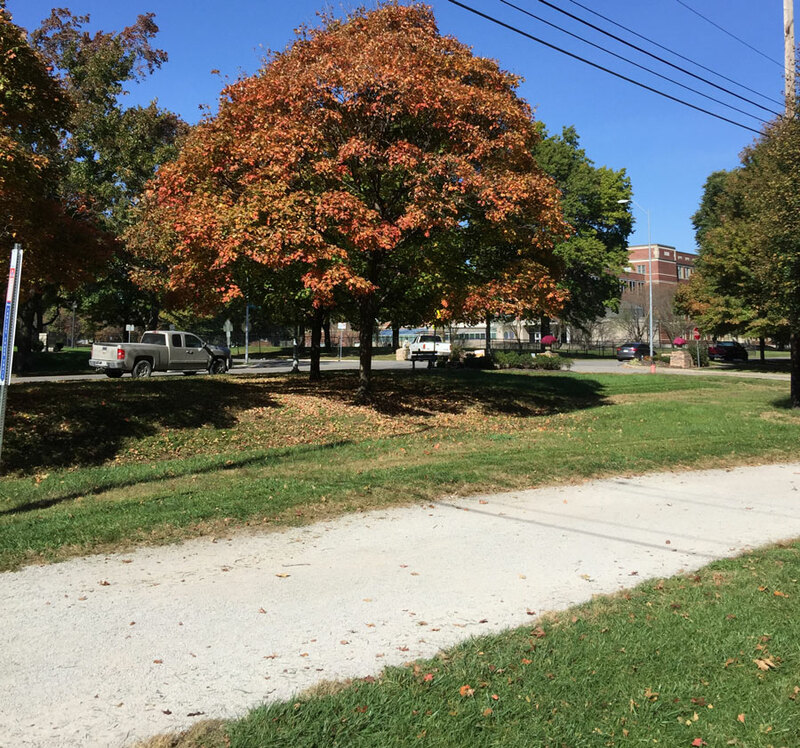 The KCATA, the City of Kansas City, Mo., and to a lesser extent, private sector adjoining property owners have jointly invested more than $5 million in enhancement projects. TIGER (Transportation Investment Generating Economic Recovery) is a discretionary grant program of the U.S. Department of Transportation funded by the American Recovery and Reinvestment Act. 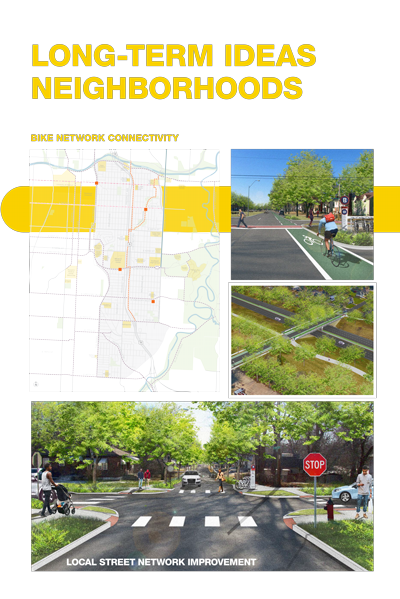 In 2010, the Kansas City region was awarded, on a competitive basis, $50 million in TIGER funding to make transportation infrastructure improvements along several regional transit corridors and in the Green Impact Zone in Kansas City, Mo. To track the progress on these projects visit the TIGER Tracker. TIGER funds will be used to rehabilitate the infrastructure in the Green Impact Zone, focusing on better transit stop amenities, traffic-signal improvements, street resurfacing and sidewalk replacement, Troost Avenue pedestrian bridge, and other neighborhood improvements. Approximately $1.42 million in TIGER funds will be used for Missouri corridors transit improvements (North Oak Trafficway and U.S. 24 and U.S. 40 corridors in eastern Jackson County). The project consists of improving bus stops and increasing pedestrian access to and from these bus stops. 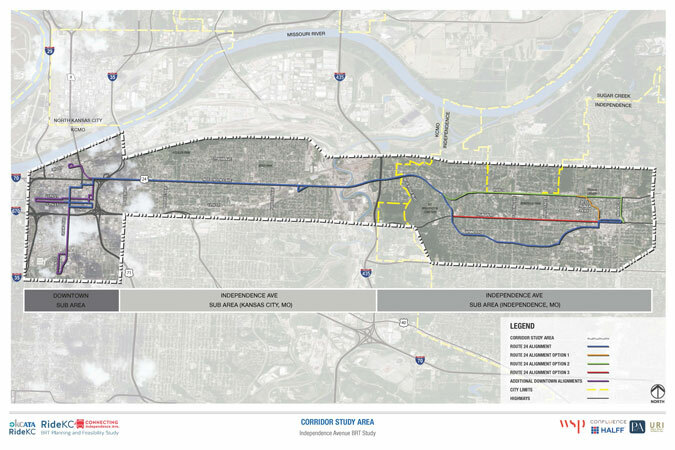 A total of $10.3 million of the $50 million TIGER grant awarded to the Kansas City region was allocated to the State Avenue corridor. 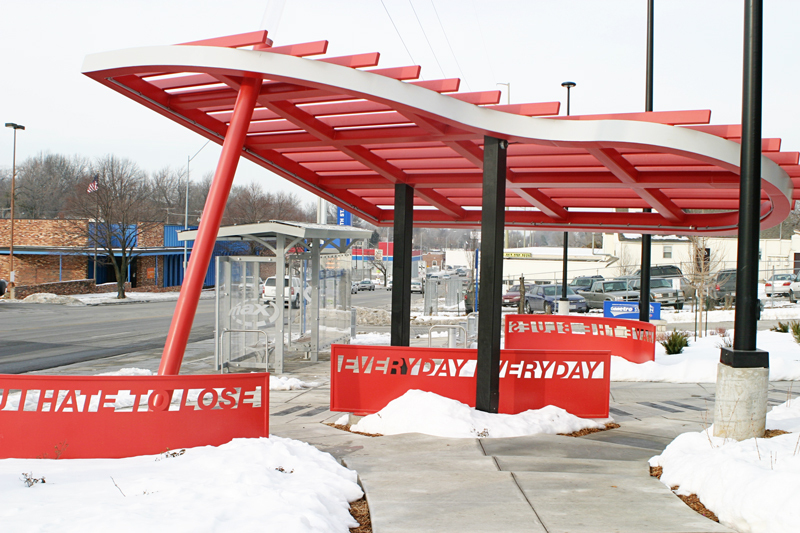 TIGER grant funds in the east-west State Avenue corridor in Kansas City, Kan., will support existing transit services through improved stops, shelters, pedestrian connections and building two new transit centers. 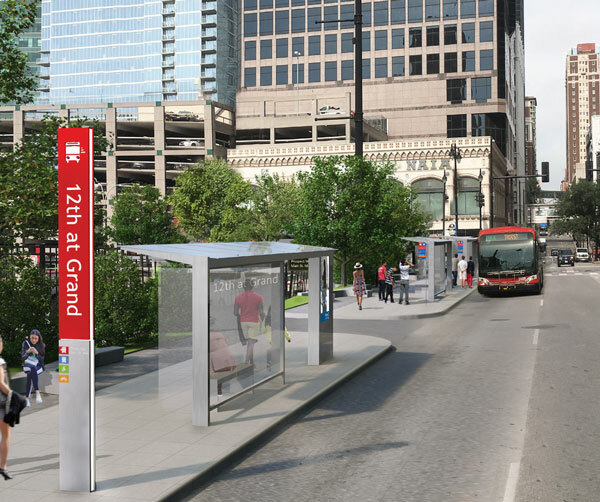 The two new transit centers for the State Avenue corridor will be located at the corner of 7th Street and Minnesota Avenue and at the corner of 47th Street and State Avenue. 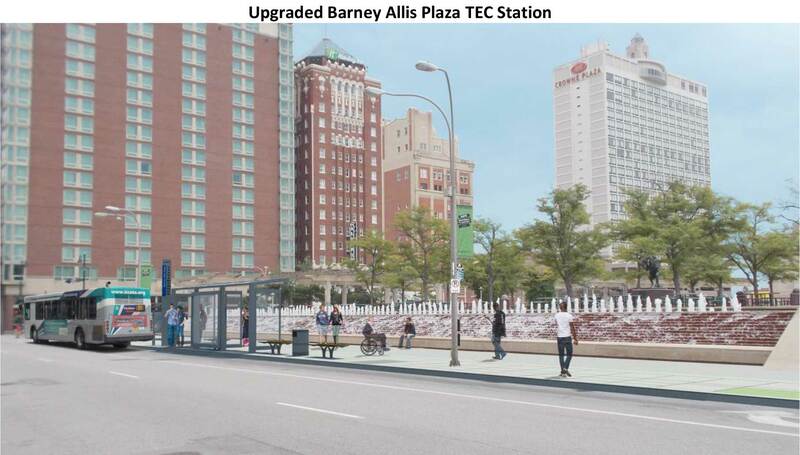 These facilities will bring dedicated transit centers to downtown Kansas City, Kan. to facilitate transit connections and transfers. As of July 2016, Stop Optimization has resulted in 620 stops outside of downtown KCMO being removed from 22 routes, which represents roughly 27% of the stops outside downtown along those routes. Of the stops removed, 54% averaged less than one boarding per weekday and 88% averaged less than five. How does removing stops benefit riders? The simple answer is that by having fewer stops, we are able to provide quicker, more reliable service with less frequent stop-starts. While we cannot attribute all of the improvement to Stop Optimization, the most definitive demonstration that Stop Optimization has produced results in this capacity is the drastic on-time performance (OTP) improvement for 30 Northeast following implementation. Additionally, by reducing the number of stops, we can better allocate limited resources to improve accessibility and amenities at remaining stops. So far, accessibility improvements have been achieved entirely by relocating stops, mostly from the nearside of intersections to the farside, which also has operational and safety benefits. By relocating stops we have improved accessibility at roughly 100 stops with minimal costs. 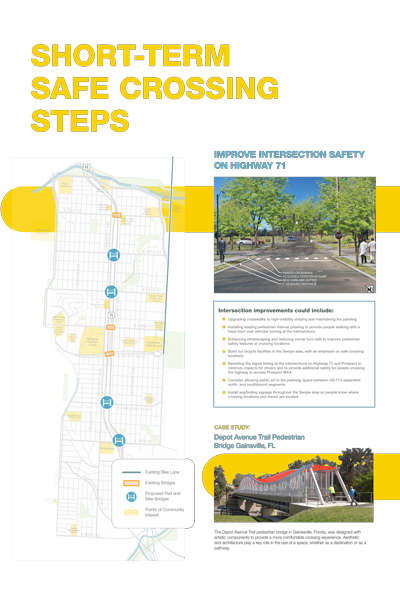 We anticipate concrete improvements at roughly 20 high priority stops to begin before the end of the year. 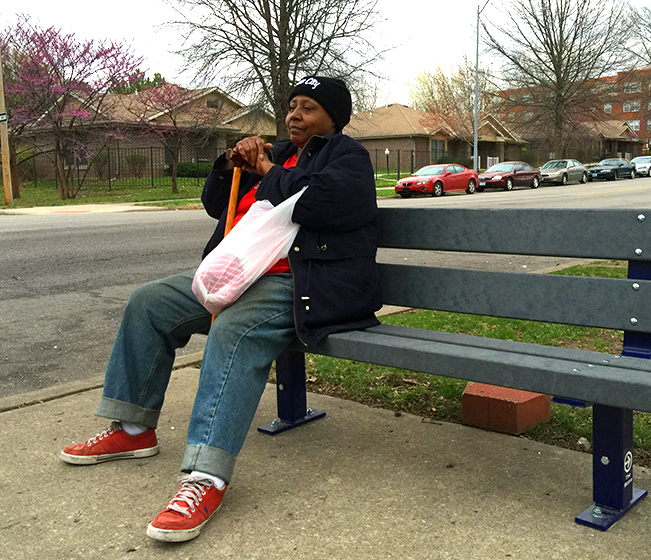 The third component of Stop Optimization consists of removing benches, shelters, etc., from removed stops or those with relatively low ridership, and reallocating them to higher ridership stops, using the standards set forth in KCATA’s Bus Stop Guidelines. While these standards served as a guide, we made additions liberally and removals conservatively. A second wave of amenity additions will be made as ridership shifts from stop removals are fully understood with new ridership data. As the chart indicates, there have been more shelters removed than installed and more benches installed than removed; however, far more riders have benefited from amenity upgrades than been inconvenienced by amenity downgrades. Additionally, quite a few locations identified for shelter addition/upgrade are among our top priority stops for concrete work improvements to improve accessibility and support a shelter. Lastly, while financial savings were not a primary consideration for the Stop Optimization program, removing the 31 shelters identified above, will save an estimated $275k/year in maintenance costs; resources that can be reallocated to upgrading and maintaining stops with higher ridership. KCATA and Unified Government Transit secured federal TIGER funding to improve the Minnesota/State Avenue transit corridor. The improvements werew made along the transit route that begins at the 10th & Main Transit Center in downtown Kansas City, Mo., travels through Downtown Kansas City, Ks., and ends at Village West. The route serves activity centers and neighborhoods along State and Minnesota avenues. 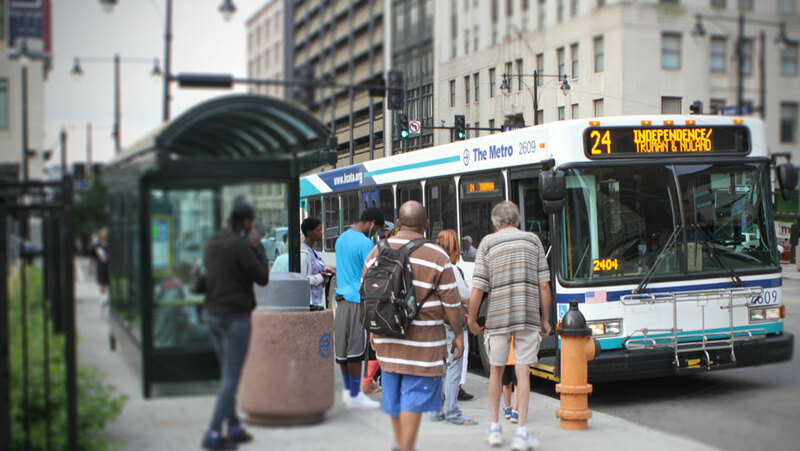 Effective transit connects employment centers, educational facilities, neighborhoods and shopping and entertainment areas. As a major east-west route through the Kansas City metropolitan area, State Avenue links Kansas City’s revitalized urban core with new development occurring farther west. With two new transit centers providing regional connections, State Avenue Connex supports the regional vision for enhanced and expanded regional transit in Kansas City. State Avenue Connex will improve transit facilities and continue to provide access to jobs, support economic development, and provide efficient transportation. Click on the map for a closer view. KCATA, UGT, business leaders, neighborhoods, elected officials, the general public, other stakeholders, and a consultant design team worked together to improve the State Avenue transit cooridor. The preliminary design process began in the spring of 2011, and final design was completed in early 2012. Construction began in Summer 2012 and finished in 2013. A Transportation Investment Generating Economic Recovery (TIGER) Grant from the U.S. Department of Transportation is funding the State Avenue bus enhancements. The grant awarded included $10.5 million for the design and implementation of these physical enhancements along the corridor. 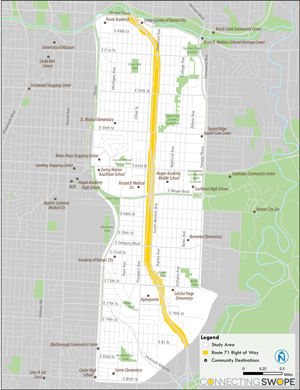 State Avenue improvements are an intermediate step to a MAX Bus Rapid Transit Line. In March 2016, KCATA began a pilot program to test how on-demand services could integrate into the suite of transportation options available in the Kansas City region. The partnership between Bridj, KCATA, and Ford was the first U.S. public-private collaboration bringing together a major U.S. transit system, an automaker, and an urban technology company to enhance existing mass transit by providing greater mobility options.The pilot was designed to share our learnings within our community; to inform future project/programs decisions; and to provide a demonstration project to the global community of public transportation providers relating to how service adaptations are required to meet the needs of an ever mobile, connected populace. 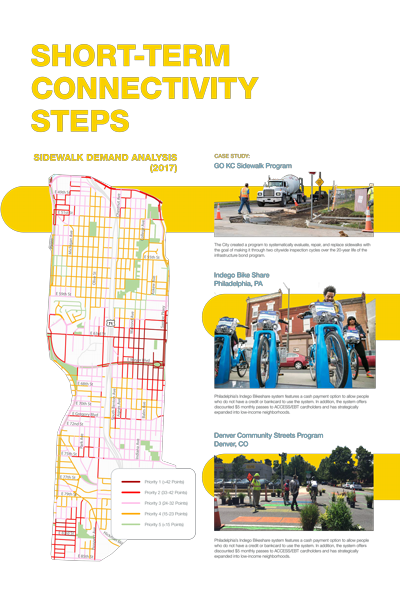 As a component of the pilot program, researchers at the Transportation Sustainability Research Center (TSRC) at the University of California at Berkeley conducted an evaluation of the RideKC: Bridj pilot program. TSRC’s goal in its evaluation is to assess the travel behavior impacts of the service, as well as to provide operational and institutional analysis. The evaluation consists of multiple pieces of analysis, including a survey of users, a survey of those who have downloaded the Bridj app, and a community survey. 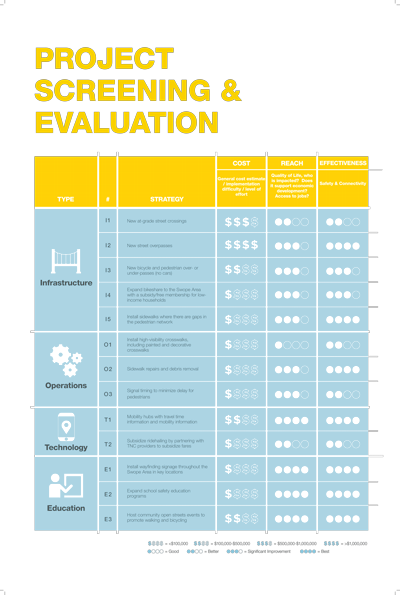 The evaluation is available here: TSRC Analysis (PDF). 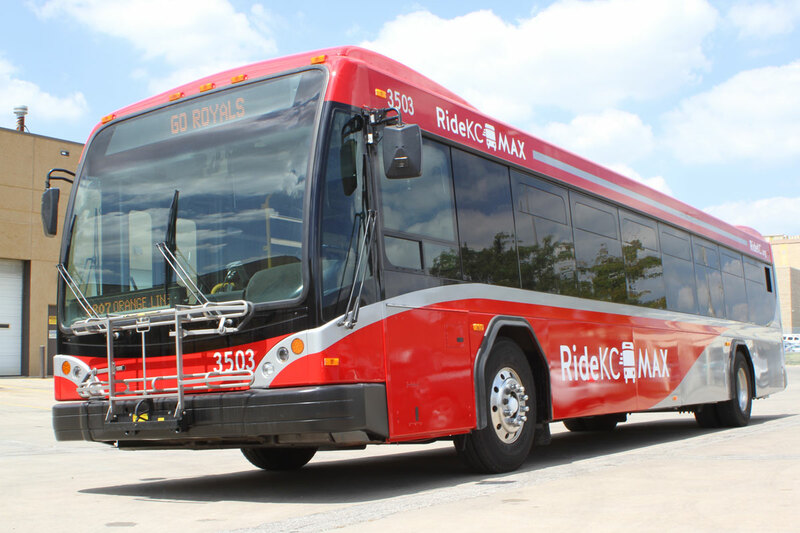 MAX is RideKC’s bus rapid transit line (BRT) serving highly populated residential and commercial corridors in Kansas City, Mo. 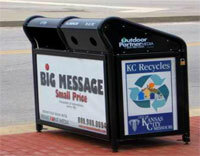 Plans are underway to implement this premium service along Prospect Ave. and into downtown KCMO. From its vehicles to service, MAX touts its unique identity. Customers reach their destinations with greater ease because of MAX’s faster, more reliable service. 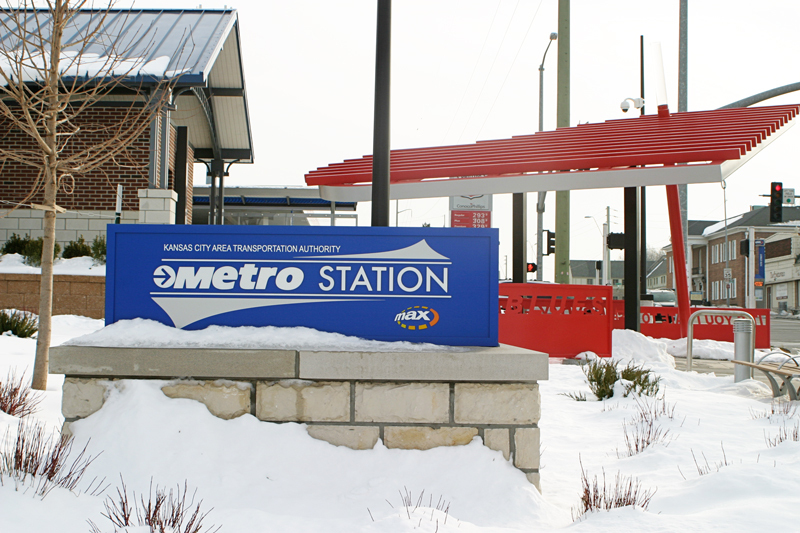 MAX vehicles have a distinctively sleek design, while MAX stations are substantially larger than standard bus stops. In addition, one of the more popular customer-friendly MAX features includes real-time arrival information that helps transit customers know exactly when MAX will arrive. By adding up-to-date technologies and an array of modern passenger amenities, Prospect MAX will substantially enhance the transit experience for existing riders while attracting new transit customers. 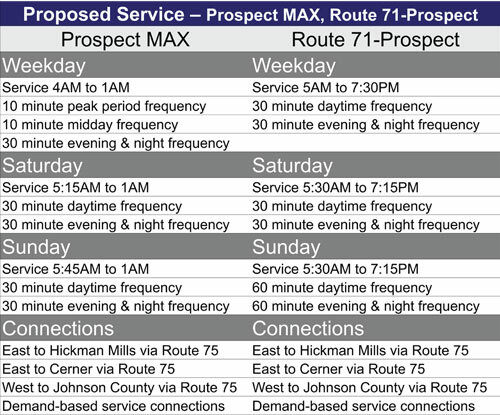 Bus service for Prospect Avenue MAX is patterned after Troost Avenue MAX, resulting in increased service, reduced travel times and stronger connections to neighborhoods. Below is a summary of the service details. Downtown Prospect Avenue MAX stations are designed to blend with the downtown streetscape, making it easier for pedestrian traffic on sidewalks. 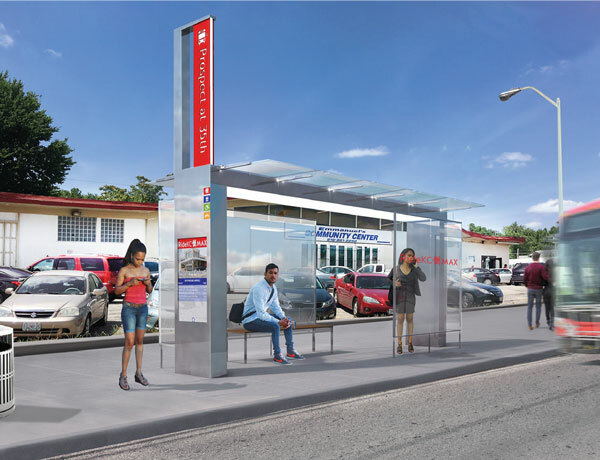 Prospect Avenue MAX stations will feature an interactive smart kiosk, real-time bus arrival information, shelter protection from the elements and enhanced lighting for improved safety and greater visibility. With service similar to rail, MAX BRT operates at a fraction of the cost. KCATA estimates Prospect MAX project will cost approximately $54 million. The project will be funded through a mix of federal and local funds. 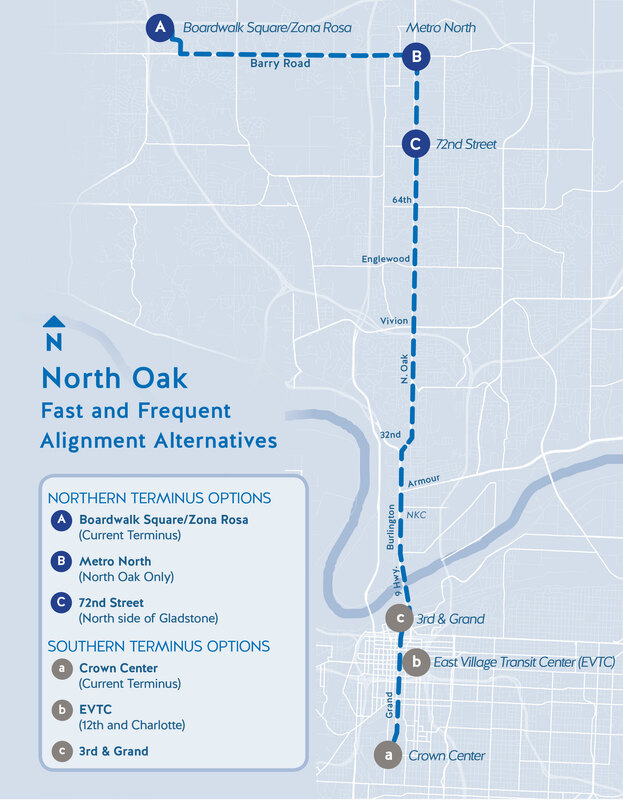 The North Oak Corridor Transit Study will provide recommendations on how transit services can better serve the North Oak Corridor and surrounding neighborhoods from downtown Kansas City, through North Kansas City and Gladstone. The study team will engage the Northland community to determine transit access needs and services along the North Oak Corridor to make improvements for increasing mobility. The study will consider the feasibility of a MAX-level transit investment in the corridor. MAX is RideKC’s Bus Rapid Transit (BRT) service that includes high service levels, increased rider amenities, and rail-like stations. The study will build on existing plans and policies to further land use and corridor development recommendations that would support a significant transit investment in the corridor. The study team developed three preliminary alternatives (as shown on the map) for fast and frequent service in the corridor. Preliminary alternatives are based on existing ridership and travel characteristics, corridor character, economic development potential, locally expressed desire, transit potential, cost and stakeholder input. MAX debuted with Main MAX in 2005, changing the face of transit in Kansas City. 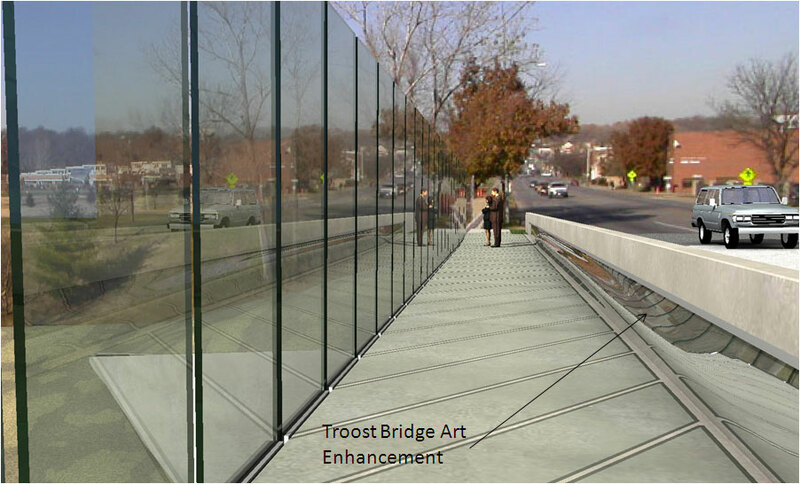 Following on the success of Main MAX, a second MAX line was developed for Troost. This line opened in 2011, featuring green technologies such as hybrid vehicles, solar lighting, pervious pavement and rain gardens. 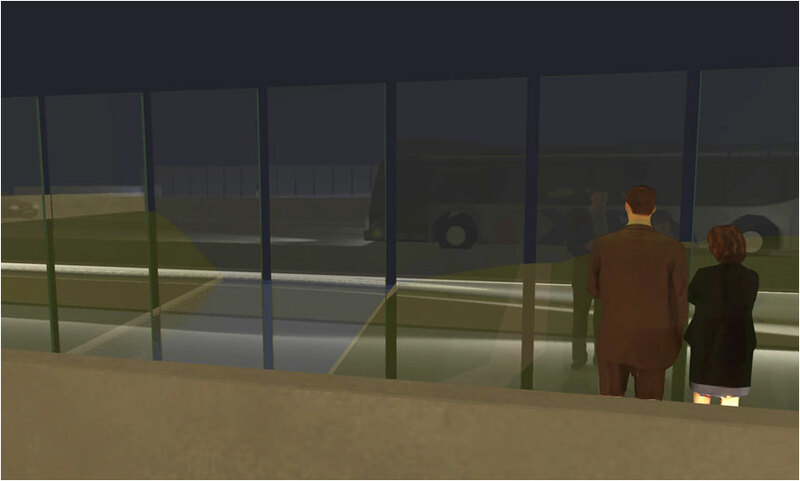 Above: The distinct looking MAX vehicle. 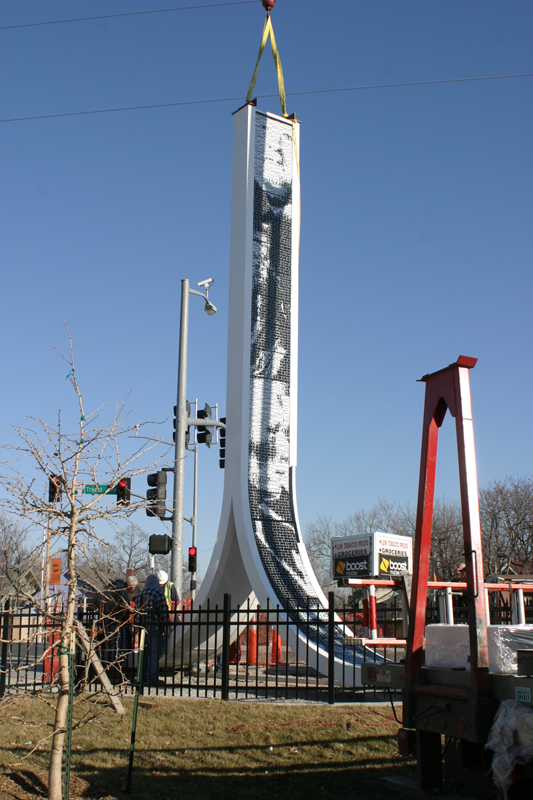 Above: The Troost MAX line features artwork along the line. 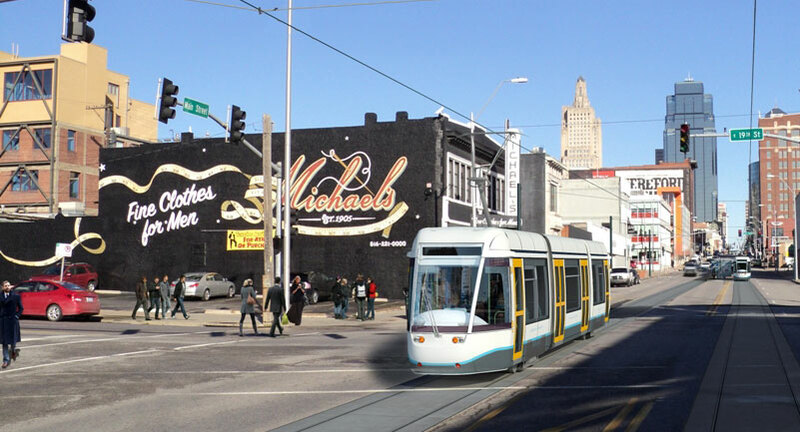 Kansas City's Downtown Streetcar is moving full speed ahead. 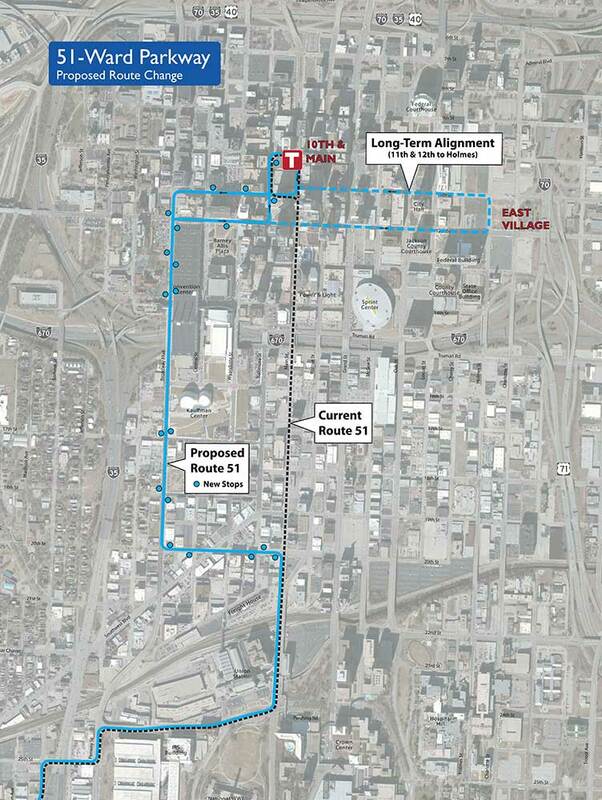 The two-mile line will run largely on Main Street from the River Market to Union Station. The streetcar will run in existing street lanes, just like other vehicles. The streetcar route will include 18 stops, spaced roughly two blocks apart. Construction of the line and stops will be completed two to three blocks at a time, and opening day is expected in mid-2015. Utility investigations started, and construction is expected to begin this summer. KCATA serves as a technical adviser for the city's compliance with Federal Transit Administration criteria and guidelines, and to the streetcar authority. 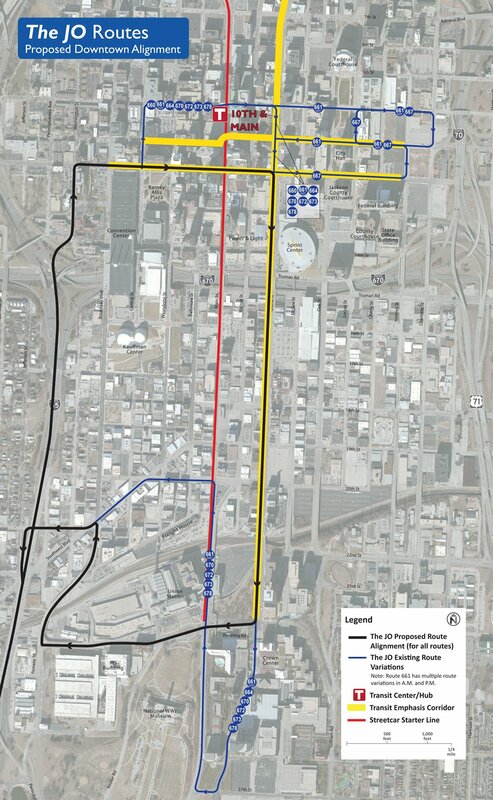 To follow the progress of the downtown streetcar, visit http://www.kcstreetcar.org. 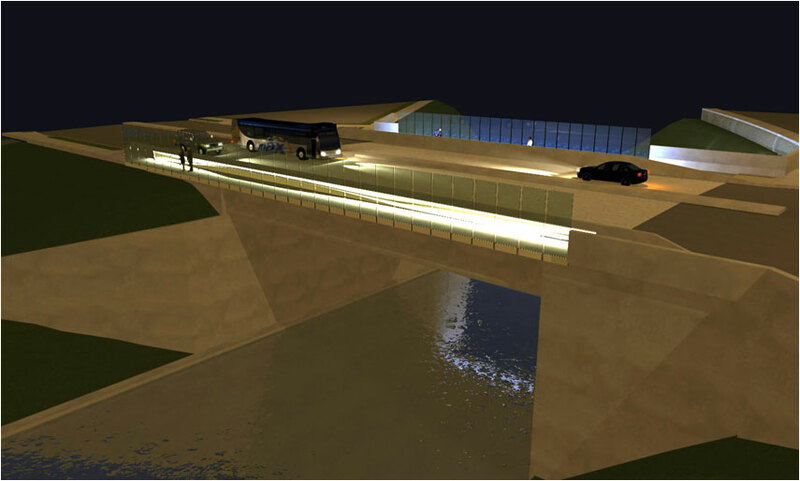 KCATA has begun a Bus Rapid Transit (BRT) study of Independence Avenue. The study will assess transit options between downtown Kansas City, Mo., to downtown Independence, Mo. This 9-mile stretch of Independence Ave. is one of the mostly densely populated and diverse areas in the region. 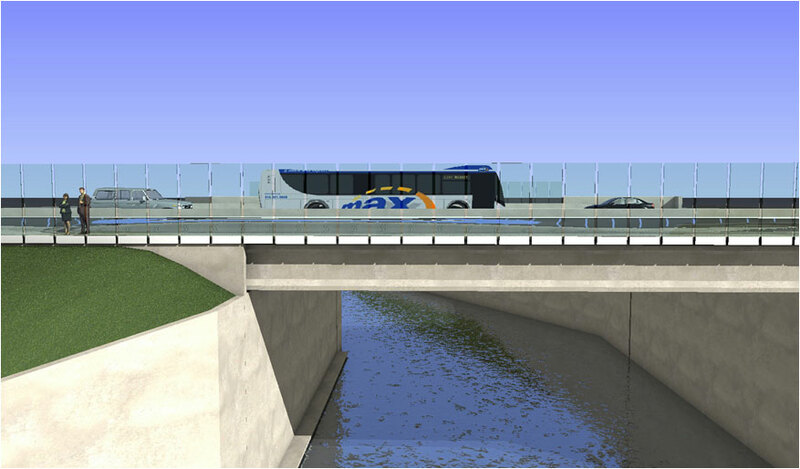 The study is seeking an optimal way to connect these two destinations with a premier BRT service while maintaining some level of local transit service as well. 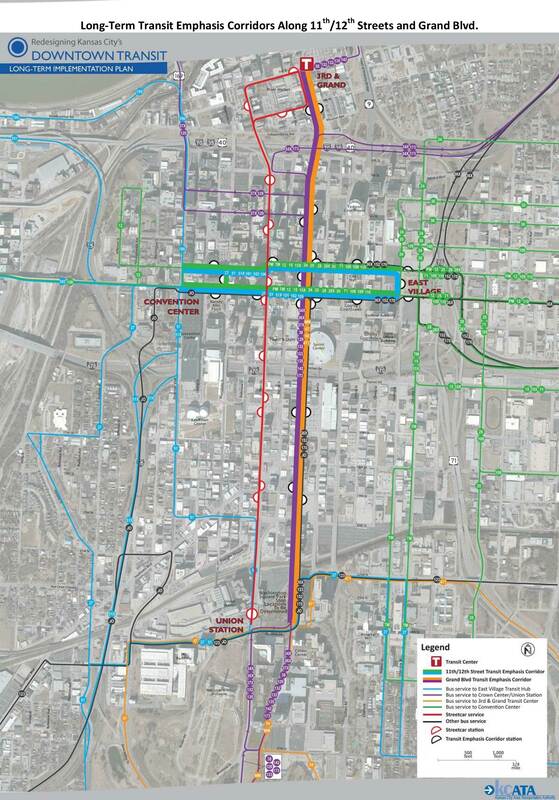 The project potentially could result in the first East-West BRT route in Kansas City. The connection to Downtown Independence would also be the first time service of this caliber would serve an area outside of Kansas City, Mo. The project team began initial study activities in January 2018, to include data analysis and a review of existing conditions and transit operations in the corridor. Advisory committee meetings and public outreach are begining in Spring 2018. Check out our website and social media pages for updates on the process and public meeting dates and times. RideKC Freedom On-Demand is a new cutting edge transit option. Freedom On-Demand begins with a strong core service for persons with disabilities and builds on that foundation to provide fast, affordable cab rides for everyone. 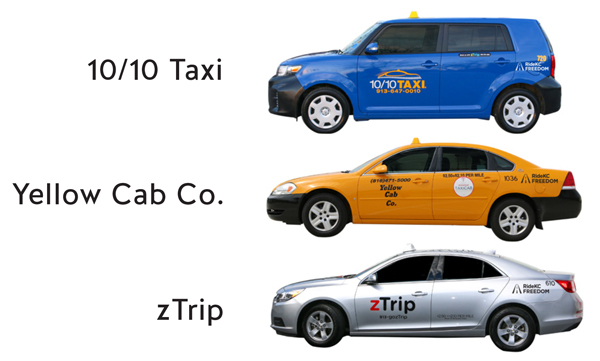 The app-based service allows anyone to book a cab ride without providing 24 hours’ notice required of paratransit service RideKC Freedom. Traditional paratransit services in Kansas City is called RideKC Freedom, formerly Share-A-Fare. Paratransit provides specialized transportation for people with disabilities who are not able to fully use the buses or streetcar that are part of our public transportation system. RideKC Freedom On-Demand is an app-based service. The RideKC Freedom On-Demand app is available in the Google Play store or the Apple App store. On-Demand program is open to everyone, but only customers who are certified as disabled under the Americans with Disabilities Act in the RideKC Freedom paratransit program qualify for a reduced fare. The general public can use On-Demand services at the regular price of $10 for the first five miles, and is $2 for every mile after. Riders without a smart phone can call RideKC Call Center to connect with a taxi dispatcher. 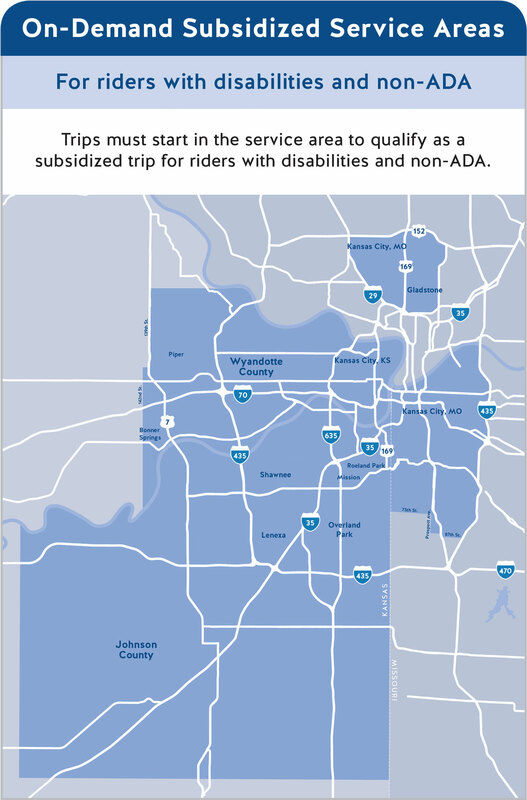 The pilot program provides subsidized trips for riders with disabilities and non-ADA riders in select areas: all of Johnson County and Wyandotte County in Kansas, and portion of the Northland, and an area south of the Missouri river in Kansas City, Mo. 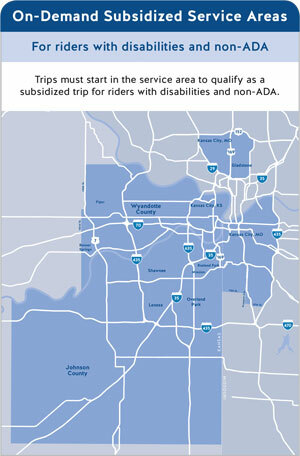 Riders must start their trip within the service area to qualify for reduced fares. Trips that start outside the subsidized service area will cost the general public fare. Downtown Kansas City, Missouri, is currently served by 42 KCATA and eight Johnson County Transit “The JO” bus routes, designed primarily to transport workers into and out of downtown. 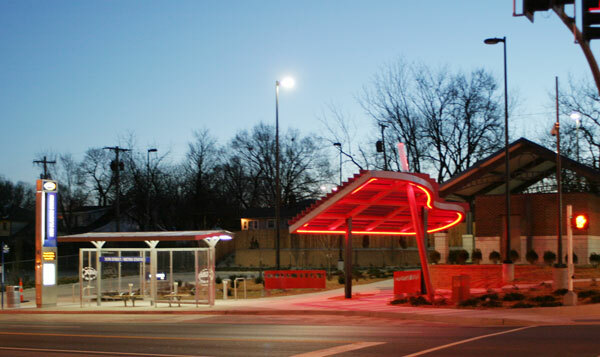 The major focal point of service is KCATA’s 10th & Main Transit Center, but its small size requires many routes to operate to other locations in downtown. Consequently, there is currently little consistency in how bus service operates downtown. With development of new convention, sporting, and cultural facilities, Power and Light District, and more people moving downtown, travel demands are changing. This concept is designed to improve downtown transit service, better meet the evolving needs of Kansas City, and provide a better balance of service to residents, workers, and visitors.